We get it, you are busy — that’s why our shop at home service comes to you at your convenience. 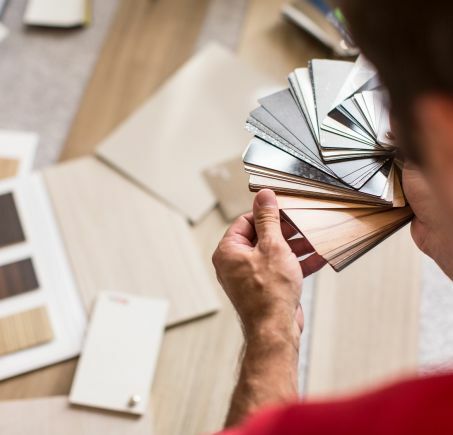 When you have a window of spare time, there are better things to do than facing traffic and finding a parking space to go floor shopping — especially when selecting flooring can be done from the comfort of your home. We have certified consultants who are skilled in matching flooring solutions to your needs. In fact, a shop at home appointment has the advantage of showing the samples in the light and décor where the flooring will be used. Since you are considering shopping at home for flooring, you’re thinking about what kind of flooring you want. We have an online form for you to fill out to start the process and get a meeting scheduled. Once you have made the appointment, gather digital photos of flooring you like and email these photos to your consultant ahead of time. An advantage of shop at home is the design consultant can see firsthand how your family lives in the space, what the foot traffic is and are there pets to take into consideration. When you are prepping for the appointment, tidy is nice… there is no need to rip everything apart and clean. Your consultant is there to help you find flooring, not an inspection. Sharp Carpet’s consultant comes to your house at the arranged time. She will bring in extensive selections of samples to go through with you. While you are making your choice, she will measure the space in order to give you an estimate. At this point, you will need to have a budget to work from. Once you have chosen the flooring, the consultant will explain any other materials needed for the installation. For example, what color grout to use with the tiles, or, do you need a noise dampening membrane under laminate. If you live in Homewood, Birmingham, Calera, Jefferson County, or Shelby County, use our online form or call the showroom in Homewood to set up a shop at home appointment at your convenience.